The small intestine is the main site where we digest and absorb nutrients and minerals from food, and it is also a place where many intestinal infections occur and digestive and inflammatory disorders manifest themselves. To better understand the intestine in its normal and pathological states, researchers have created "organoids" by isolating intestinal stem cells from human biopsy samples. These organoids form all of the cell types present in human intestine, but they grow as cysts surrounded by thick extracellular matrix gels with their "apical" cell surface (which is normally exposed to the content of the gut) facing an enclosed lumen. This prevents the study of dynamic processes involving the intestinal barrier, including nutrient and drug transport, as well as its interactions with the microbiome. In addition, organoids lack a vasculature and the mechanical movements caused by normal peristalsis and blood flow, which are vital for many processes in the gut, including its regeneration and control of bacterial overgrowth. In an effort to overcome these limitations, a team at the Wyss Institute for Biologically Inspired Engineering led by its Founding Director, Donald Ingber, M.D., Ph.D., had previously engineered a microfluidic "Organ-on-a-Chip" (Organ Chip) culture device in which cells from a human intestinal cell line originally isolated from a tumor were cultured in one of two parallel running channels, separated by a porous matrix-coated membrane from human blood vessel-derived endothelial cells in the adjacent channel. Although this human Gut Chip recreated the villus epithelium of normal intestine and enabled new insights into how flow and cyclic peristalsis affects intestinal differentiation and function, it could not be used to study processes that relied on normal intestinal cells from individual donors, which, for example, is crucial for studying patient-specific responses for personalized medicine. In a new study, published in Scientific Reports, Ingber's team now removes these roadblocks. "We are now able to leverage the organoid approach to isolate intestinal stem cells from human biopsies, but we break up the organoids and culture the patient-specific cells within our Organ Chips where they spontaneously form intestinal villi oriented towards the channel lumen, and the epithelium in close apposition to human intestinal microvascular endothelium," said Ingber, who is also the Judah Folkman Professor of Vascular Biology at Harvard Medical School (HMS) and the Vascular Biology Program at Boston Children's Hospital, as well as Professor of Bioengineering at Harvard's John A. Paulson School of Engineering and Applied Sciences (SEAS). "This approach presents a new stepping stone for the investigation of normal and disease-related processes in a highly personalized manner, including the transport of nutrients, digestion, different intestinal disorders, and intestinal interactions with commensal microbes as well as pathogens." The team collaborated with David Breault's laboratory at Boston Children's Hospital to build an organoid culture step into their procedure to isolate normal intestinal stem cells and increase their cell numbers. The resulting organoids could either be banked for future use or immediately fragmented and seeded into the "epithelial" channels of multiple Organ Chips where they were further matured by flowing specialized culture medium and applying mechanical stimulation to the channels to mimic physiological peristalsis-like motions. The epithelium's maturation into a villus intestinal epithelium with long finger-like extensions was helped along by co-culturing human intestinal microvascular endothelial cells on the opposite side of the shared matrix-coated porous membrane in the "vascular" channel where they assembled a surrogate blood vessel with a hollow lumen through which feeding medium was flowed. Thus, combining two of the most advanced technologies in the field of tissue engineering ? organoid culture and Organ Chips ? allowed the generation of intestine tissues and organ-level structures lined by human donor-specific cells with morphology, composition, and function strongly resembling that of the duodenal region of normal small intestine. "Because the primary Small Intestine Chip recapitulates the physical microenvironment that cells experience inside the human body, such as fluid flow and cyclic peristalsis-like stretching motions, it exhibits a genome-wide gene expression profile that comes closer to its in vivo counterpart than that of the same intestinal cells grown as 3D organoids," said first-author Magdalena Kasendra, Ph.D., a former Postdoctoral Fellow on Ingber's team and now Principal Scientist at Emulate, Inc. in Boston. 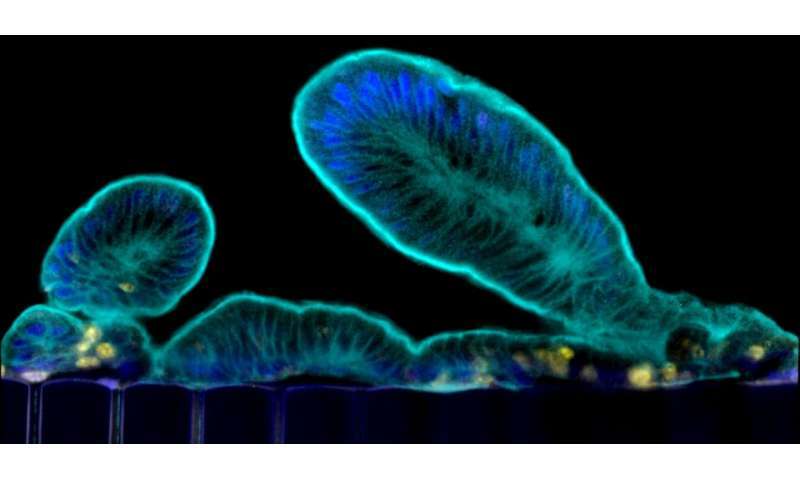 Ingber's team is applying the same approach now to different regions of the intestine—duodenum, jejunum, ileum, and colon—whose functions and disease vulnerabilities differ from one another. This approach is also being used to reverse engineer even more complex gut environments by integrating other cell types, such as immune cells, neuronal cells, and commensal microbes into the device. "In the future, such efforts could allow us to much better understand human-microbiome interactions, model malnutrition disorders and inflammatory diseases of the gut, and perform personalized drug testing," said co-first author Alessio Tovaglieri, a Graduate Student at the Department of Health Science and Technology at ETH Zurich in Switzerland, who performs his thesis work on Ingber's team.